Well, I'm almost there. 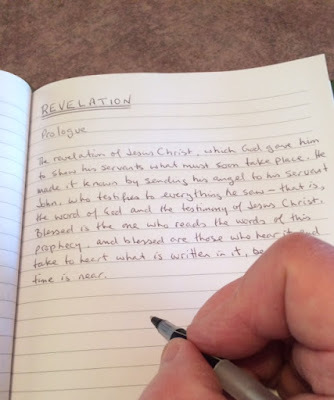 Twenty two more chapters, and I will have hand-written the entire New Testament! 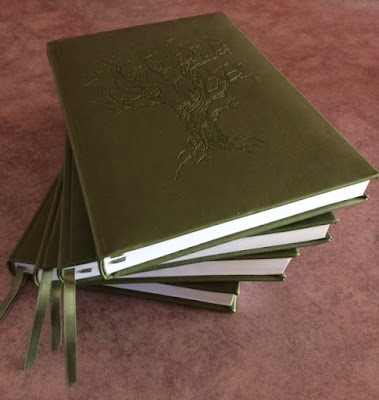 What an incredible journey that began just after Thanksgiving, in October of 2016, when I introduced my new devotional routine with a blog post that I called, Me as an Amanuensis: Morning Devotional's Next Level? When I began this twenty-two weeks ago, I never really imagined how much I would get out of the exercise and how much I would enjoy it. I typically spend an hour to an hour and a half every morning, usually starting at about 4:30am. Depending on the length of the chapters, I will usually write one or two chapters in a sitting on workdays; weekends I sometimes add a third. The main thing I've learned in this process is how much more I get out of reading the Bible now than I did before. When one has to copy each and every word and punctuation mark, the reading becomes slower and, I've found, much more meditative in nature. I've discovered so many little nuggets along the way that, though I've no doubt read them countless times before over the years, it was like reading them again for the very first time. Now I'm not just thinking about what I'm reading, but I'm also forced to think about what I'm writing, and in turn, then reading all over again once the text has been copied. The New Testament really has come alive, which in turn has enhanced my prayer life, and created a more calmness to my otherwise typically stressful workday. Morning devotions are awesome once again! But twenty-two chapters won't take long; eleven days at the best. Then what? I don't just want to stop a devotional routine that has been such a blessing. I had thought of then continuing on by hand-writing the Psalms and Proverbs, but now I've changed my mind. Instead, I've decided to go big and hand-write the entire Old Testament as well. I am estimating that it will take about 18 to 24 months to complete, although it could take longer. There's no hurry, though. I'm now also looking forward to what God will show me in the pages between Genesis and Malachi. Exciting! The only thing I need to do now is to stop by our local Chapters and pick up some more journal books. Bookstores are dangerous places for me, however, so I'll have to be very careful. It's too easy for me to get lost in an aisle and ultimately walk out with more books than I intended to purchase. Strange, the good folks at Chapters don't mind when that happens, however (ha, ha). So if you're looking for a new early morning devotional routine, maybe this is for you too. Peace. I was in Chapters the other day and bought a copy of Henri Nouwen’s The Return of the Prodigal Son. It is a special two-in-one anniversary edition, which also features another of his works, Home Tonight. While not yet through the book in its entirety, I am having a hard time putting it down, which in my way of thinking, speaks volumes for the quality of a book. 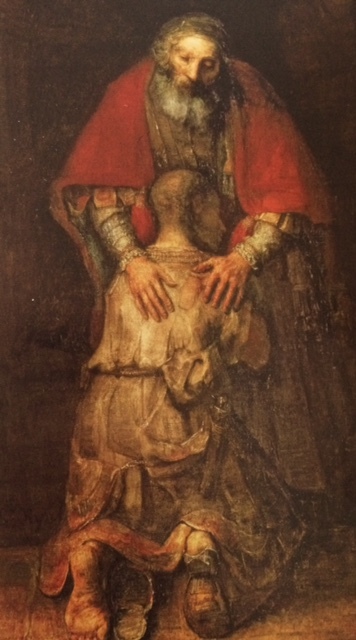 It is rich with insight and application, which for Nouwen began with a chance encounter with a copy of Rembrandt’s The Return of the Prodigal Son. I guess I’ve always related to the Prodigal Son (Luke 15), often identifying myself with the younger of the two brothers in Jesus’ parable. No doubt you recall the story, of how a father had two sons, and the younger of them goes to his father and asks for his share of the inheritance, and then promptly takes off to a far country where he squanders everything in a wild lifestyle, eventually becoming destitute. After a season of hiring himself out to feed someone’s pigs, who the parable tells us ate better than the son did, he comes to his senses and returns home, apologetic script for dad in hand, and throws himself at the mercy of his father, not really expecting to be accepted as a son anymore, but hoping that perhaps he might just maybe be accepted as a hired servant, or even as a slave. Now when I said that I had often identified myself as the prodigal, I meant that only insofar as I was identifying with leaving home at a young age, a little ruff around the edges with a questionable lifestyle, a sixteen year old with forty years of life experience (or so I thought and acted), full of attitude and thinking the world owed me a big fat living. Boy, if I could only go back and meet that young man once again, I’d like to knock some sense into him! Several years later after (thankfully) maturing a bit more and coming to my own senses, I too returned as a changed man to my father’s house, figuratively speaking, though I never actually lived there again. However, there is so much more to the parable of the Prodigal Son than just that of a rebellious teenager gone amuck. There is another way that maybe we all, from Adam right up to today, are just like the Prodigal Son; we all have gone astray to some far off country. “There is no one righteous, not even one; there is no one who understands, no one who seeks God. All have turned away, they have together become worthless; there is no one who does good, not even one” (Romans 3:10-12). No exceptions; we’re all painted with the same brush. Ultimately, are we not all prodigal sons and daughters? I think we are, the only question is, where in this pilgrimage exactly are we? Has anyone ever made such a request in your village? Could anyone ever make such a request? If anyone ever did, what would happen? His father would beat him, of course! I can honestly say that I have never ever thought of it that way. Pretty harsh, wouldn’t you say? Do you suppose that is what the father in the parable was thinking too? If so, then that request from the younger son shows, not just an awful lot of nerve and disrespect, but also the extremes possible when sin is allowed to have the day. I mean, what was he thinking? Was his dad not dying fast enough? Maybe the younger son really did need a time out behind the woodshed with dad and a good old fashioned strap! But that was not the father’s way. The son didn’t get the lashing that he deserved for being disrespectful and wishing his father were dead; instead the father gave him what he wanted, and the son packed up and left his hometown, and his father's house, and moved far away to some distant place. We’ve all wandered away from our Heavenly Father’s house, taking our share of the inheritance with us, though not perhaps wishing the Father were dead in so many words (and yet remembering that they did kill God the Son), but falling for the devil’s lies enough that the rest of the story may just be a case of semantics. What we really deserve is to be taken behind the woodshed and taught a lesson or two, but Father God, in his great love, just let’s us go, not giving us what our disrespectful and downright sinful ways deserve, but letting us choose our own paths, and hoping that one day we'll return home. Thank God the story doesn't end there. But the story doesn’t end there; the younger son returns and is welcomed home with the father’s embrace. I like to see Father God in that light. Yes, we’ve all gone off to our own “distant country,” and squandered our heavenly inheritances in immorality and debauchery, living lives that only prove all the more our need for a Saviour; our need for a Redeemer. So which of the brothers was closer to the heart of the father? Did not the father love them both equally? Of course he did. But when the younger son returned from his “distant country,” the eldest son was still stuck out in his own “distant country.” Did the eldest son ever come around, make peace with his father and his lost brother, go into the house and join the party? While we hope that he did, we aren't told, we don’t know; all we can do is speculate. While we all can conjure up images of the prodigal son easily enough; the child who grew up in a good Christian home, went to Sunday School, was baptized at an early age, and then somewhere in his or her young adult life, perhaps, he or she walked away from the church and from the faith that Mom and Dad raised him or her in. We’ve all witnessed or heard about those stories, although often mentioning them has become somewhat taboo in many church circles. But the image of the older son we don’t really see as clearly; it’s a little hazier, perhaps, than that of the younger son, and as such is easily missed altogether. As I think about him or her, I see someone steeped in religion, going through the motions of a faith they don’t really necessarily even believe in. Tradition, perhaps, dictates their “walk with God,” though it’s questionable at best if God is even in that thing they so dutifully do Sunday after Sunday. I see someone who is perhaps even a little hypocritical, such as the Pope recently called them, suggesting that they try atheism instead (ouch!). Is this the older brother? He’s going through the motions well enough, but without his own genuine journey back to the Father, it may be that he remains just as lost as his younger brother earlier was. Which son do you identify more with? Though I am no longer in the pastoral ministry of the institutional church, my “ministry,” and that of everyone identifying with the father in Jesus’ parable, is really the only true ministry of the church today; it is the “Ministry of Reconciliation” (2 Corinthians 5: 11-21). That is what the younger son received from the father; that is what the father wanted to desperately give the older son as well, but he wasn’t going to force the matter. When we identify with the father, the “Ministry of Reconciliation” has us saying with the Apostle Paul, “We are therefore Christ’s ambassadors, as though God were making his appeal through us. We implore you on Christ’s behalf: Be reconciled to God” (2 Corinthians 5:20). Do you identify more with the younger son or the older son? Regardless who you once were, may you now identify with the father. May the "Ministry of Reconciliation" now be yours. First photo source: Rembrandt copy of "The Return of the Prodigal Son," taken from Henri Noun's book by the same name; Anniversary Edition. 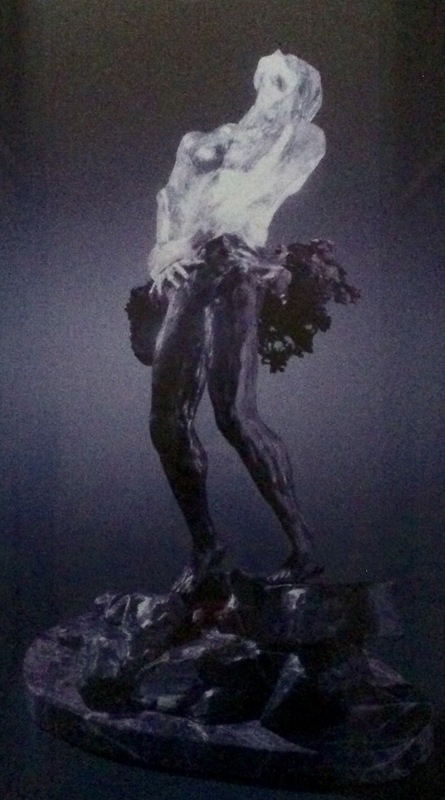 Second photo source: Entitled simply, "Born Again." From a framed poster my wife and I have had hanging in our living room for many years. (2 Corinthians 5:17). Artist unknown. This past Christmas season, we took advantage of some Boxing Week sales and purchased a 7.5-foot tall artificial Christmas tree that came pre-wired with 600 LED lights. With its 59-inch diameter, it should be quite the tree when we set it up for the first time at Christmas 2017. We haven’t had a Christmas tree in many years, at least since the kids grew up and moved out of the house, and we might not have bothered this year either, if it were not for the fact that we now are grandparents and will once again have a toddler wandering the house at Christmastime. Ah, the seasons of life. But this is only March, and I’m not really interested in discussing Christmas. What I’ve been thinking about lately is that all but forgotten other event of the church calendar: Pentecost, and more specifically, Whit Sunday; the day the church used to celebrate the coming of the Holy Spirit. What ever became of that? We celebrate Christmas and Easter well enough (all though how “well” is probably subjective), but what is perhaps the most important day of the church year, Pentecost, we have become strangely quiet on, letting it pass us by relatively unnoticed. Is it easier to celebrate Christ’s birth, death and resurrection, than it is to celebrate being born again? Stop and think about that for a moment. Taken to the next level, is it easier to join the world and give lip service to his birth and resurrection, blended as it’s become with a plethora of secularism, than it is to go out into the world with his message? Maybe it costs less to give gifts to one another at Christmas than it does to give ourselves at Pentecost. If Christmas is about God “with” us, Pentecost is about God “in” us. Is God “in” you? After that first Easter and before Pentecost, we read in John’s gospel that the disciples were huddled together behind locked doors for fear of the Jews (20:19). Now stop and try to imagine that for a few moments. They were hanging out together behind locked doors in fear of others. Does that sound familiar? At the risk of stepping on some toes, that sounds an awful lot like much of what we see in the church today. We’re really good at doing the holy-huddle behind closed doors, for fear of what our neighbors and the secular world around us thinks. But what are we scared of? Hmm, I wonder. As I imagine the early church with Pentecost eliminated, I see a few pathetic individuals, people who have been given an incredible message of hope and good news, huddled together with their paralyzed message going no where. They would have been powerless. As I look at the church today, I see people big on Christmas, not quite so big on Easter, but when it comes to Pentecost, well, you have to wonder sometimes if they’ve even experienced it at all. Has the church of today become powerless too? I think that’s a valid question, don't you? At the very least we seem to be clinging to a paralyzed message. How sad! Moving forward from John 20 and into Acts 2, we see the Holy Spirit come at Pentecost. Suddenly their fear of the Jews led to Peter standing up with the rest of the disciples (Acts 2:14) and boldly tell the message of hope and good news, to perhaps some of the very people he was hiding from behind locked doors earlier. The result? “Those who accepted his message were baptized, and about three thousand were added to their number that day” (Acts 2:41). Three thousand converts in one day! Wow! Can we even begin to really imagine that? Suddenly, because of having experienced Pentecost, they were no longer paralyzed. Suddenly, a handful of formerly timid men, instantly grew in number to about 3000 in just one day. Suddenly, having gone beyond only Christmas and Easter, they experienced the indwelling of the Holy Spirit. Suddenly, for that small group of disciples, "God 'with' us" became "God 'in' us." Suddenly, the church was born. Suddenly, there was good news and there was hope, and if ever the was a time and reason to praise God, this was it! Somehow, somewhere, the church became powerless. What happened? Did the riches of the world entice us a little too much? Did we lose sight of our first love? Did we once again become scared? 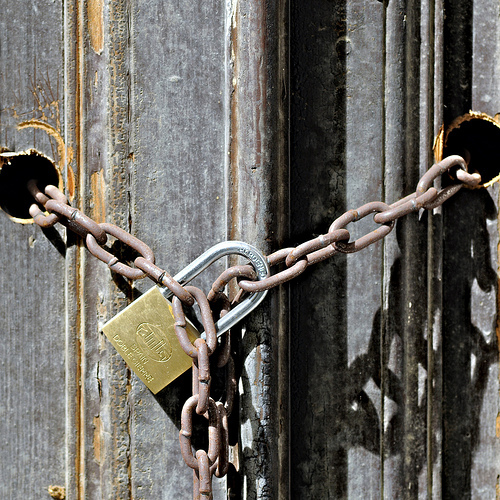 Did we rely too much on our institutions and buildings with those big lockable doors? Did we become more comfortable once again in our holy-huddles on wooden pews? Would we rather celebrate a baby’s birth and decorate our homes with artificial Christmas trees and ornaments and tinsel, and in the process lapse back into a form of pseudo-idolatry (I know, ouch!)? What became of the church’s once powerful soul-winning message? Never mind the 3000 converts in one day, when was the last time we saw even a handful of new church members (and I’m not talking about shuffling sheep from one institution to another either), converted from their godless way of life to being born again through the power of the Holy Spirit? Ah, but don’t we have such lovely Christmas pageants and live nativity scenes to invite our neighbours to? (Yes, I’m being facetious, but only a little). But seriously, have our priorities somehow become screwed up? Hmm. I think there’s another fear that many of us have, at least those of us who come out of a more conservative or evangelical camp, and that is the fear that by celebrating Whit Sunday, the seventh Sunday after Easter, we might be embracing something out of the Catholic, Anglican, or one of the other mainline liberal churches, complete with religious pomp and ceremony. But who gave them exclusive rights to the celebration of Pentecost? And who says that observing Whit Sunday needs to be with religious pomp and ceremony? Can conservative evangelical Christians not also observe Pentecost like they do other dates on the church calendar? Cannot Christians who fellowship outside the traditional institutional church not also celebrate Pentecost? Still further on that, there is probably a fear by many that it too can become just another empty or shallow date on the religious calendar, and so we've thrown out the proverbial baby with the bath water. After all, didn’t the apostle Paul say, “One man considers one day more sacred than another; another man considers every day alike. Each one should be fully convinced in his own mind” (Romans 14:5). If the truth were really known, I have usually held to the latter; every day is alike. Still, I think there is real value in rediscovering Whit Sunday, if for no other reason, than that it refocuses us back on what happened on Pentecost, just as surely as we focus on the manger birth at Christmastime and celebrate the birth of our Savior. While I doubt there will ever be another Pentecost quite as grand as that first one, I do believe that God is still in the Pentecost business; he still gives his Holy Spirit to those who genuinely seek Him. So go ahead and circle June 4th, 2017, Whit Sunday, on your calendar. Celebrate Pentecost. Celebrate the birth of the church and the giving of the Holy Spirit. Unlock and open the doors and shake yourselves loose from your lethargic holy-huddles. Be free of your paralysis and stop being scared of __________ (fill in the blank). And who knows, we too may one day see many of our non-Christian family and friends join us in the family of God as they experience their own Pentecost. So if you haven’t already, “Repent and be baptized, every one of you, in the name of Jesus Christ for the forgiveness of your sins. And you will receive the gift of the Holy Spirit” (Acts 2:38). Finally, let me ask you: Are we going to continue being content with the status quo, or is it time for a real spiritual awakening, a real honest to goodness experience of God and his power? Is it time for the church to move back out into the world, or are we going to continue to be content, impotently stuck on our wooden sliver-infested pews, stuck somewhere between Easter and Pentecost, doing little more than counting down the days until we can once again put up our Christmas trees? Christmas and Easter have already dawned, but has Pentecost? Sometimes I wonder. 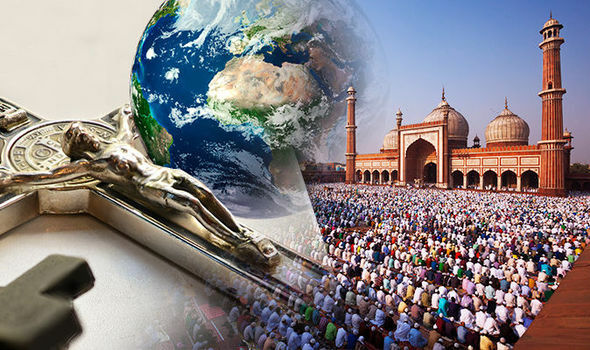 Will Islam Become the World's Largest Religion by 2070? I just read an article that made the following claim: "Islam is set to overtake Christianity as the world's largest religion by 2070" (see source link at end of this post). Does that seem likely to you? Would you, like many of the masses, blindly accept that, or do articles like this raise a few red flags for you? Now maybe it's just semantics, and you're certainly welcome to disagree with me, but I have a few red flags when it comes to "studies" like this one. According to the article, Muslim growth between 2010 and 2050 will virtually double that of Christianity's growth during the same period to the tune of 73% for the former versus only 35% for the latter. Do I think it's true? Probably. One could cite all sorts of reasons for this, the simplest of which still seems to me to be that some cultures seem to have larger families than others; simple math, and all that. However, true or not, that is not the first thing I thought of in reading this. The first thing I thought of in reading this is, given how factioned the church is (acts of the sinful nature, says Paul, in Galatians 5:19-20), what do they even mean by "Christian?" Are they talking about Roman Catholics? Eastern Orthodox? Protestant (whatever that means)? Evangelical? Charismaniacs (sorry, couldn't resist)? And what about some of the cults? Even some Mormons like to think of themselves as "Christian." Maybe the authors of this "study" had still something else in mind; maybe they painted everyone with the same brush. Perhaps they have in mind everybody who uses the name "Jesus" in some fashion or other, regardless how far apart their theology might otherwise be from each other. But then again, someone might swear using the Lord Jesus' name (in vain); is he/she included in this group of "Christians" too? While technically I guess I too fall in the "Christian" camp, but that's become such a loosy-goosy term of late, that I'm almost hesitant to use it to describe myself. If the truth be known, I dare say that many so-called "Christians" would not even label other "Christians" as "Christians." Does that make sense? Weird, I know. Hmm. Having said that, obviously there are different factions within Islam too. Did the "study" include them all? Are the Muslim extremists included with the Muslim moderates? And what about the various other Muslim sects? Does once size really fit all in Islam like it seems suggested of in Christianity? And then there is that nasty word: "Religion." Many true Christians, myself included, loathe the use of that word to describe their faith. Granted, for much of the so-called "Christian" world, their faith is only something religious that they do or identify with in some form or another. But for many, if not most, true believers in the Lord Jesus, their faith is probably better described as a relationship, and in truth, anything but a "religion." So how does that fit in a "study" such as this? No doubt it was conducted by secularists who don't really understand the faiths they were studying. It all sort of reminds me of a World Religions class I took back in Bible college. I remember thinking that it strange that a Christian professor could teach what other eastern and western religions believed, without actually believing in that religion himself. Doesn't that leave an awful lot open to subjectivism? Likewise, isn't it somewhat strange to have non-Christian (and even non-Muslim) people "study" these two faiths and and to group who knows what together under the same umbrella of the one or the other? Call me a doubting Thomas if you will, but studies like this leave more questions unanswered for me than answered. So, according to this "study," some "religion" will become bigger than some other "religion." So what?! What does that even mean?! But what about the true church; the born-again, Spirit-filled, bride of Christ; those who really "are" the church, as opposed to only those religiously "going" to some religious institutional church, to which Jesus will one day say, "I never knew you;" does that even matter? Are they also included in that menagerie pseudo-Christian smorgasbord? I wonder.